Members of the 17th Va. 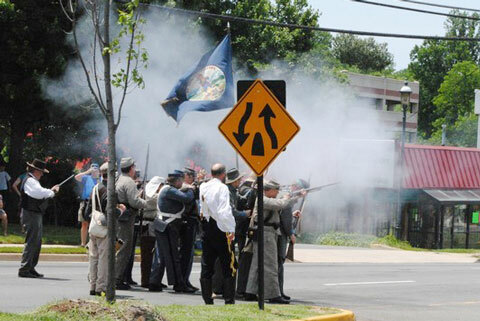 Inf., Fairfax Rifles portray the 17th Va. 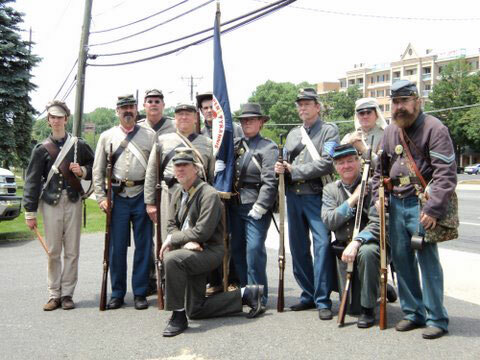 Inf., Warrenton Rifles with Captain Chris Hoehne (kneeling, left) as Captain John Q. Marr. Pvt. 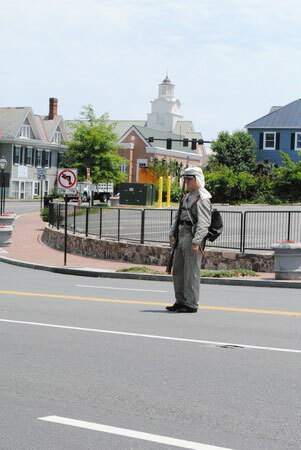 Mark Maloy of the Fairfax Rifles portrays Pvt. Francis of the Warrenton Rifles who fired the shot warning of the approaching Yankee Cavalry. Photo by Holly Nunn. 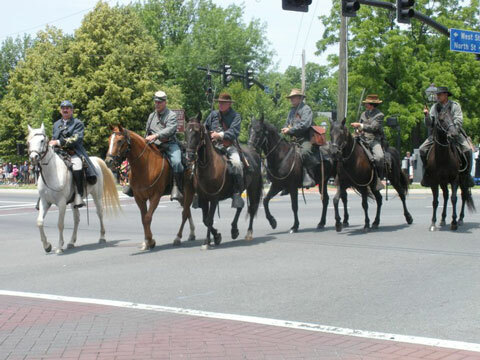 The Union Cavalry enters the village. Photo by The History Guy - William Connery. 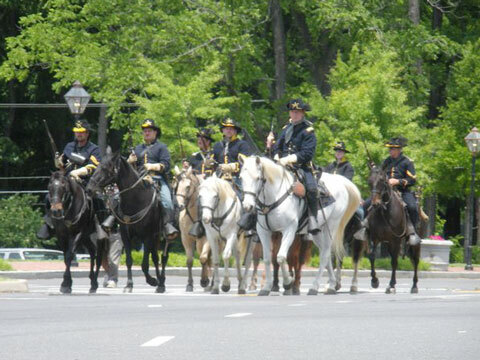 The Cavalry of the Potomac reenacts the 2nd U.S. Cavalry who were commanded by Lt. Charles Tompkins. Tompkins would win the Medal of Honor for his independent action. Photo by The History Guy - William Connery. 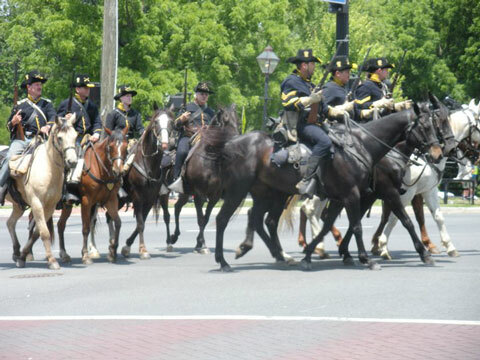 The Black Horse Cavalry portray the Confederate Prince William Cavalry. Photo by The History Guy - William Connery. Lt. Col. Ewell (Chris Godart in white shirt) was wounded when the U.S. Cavalry started firing into the village. 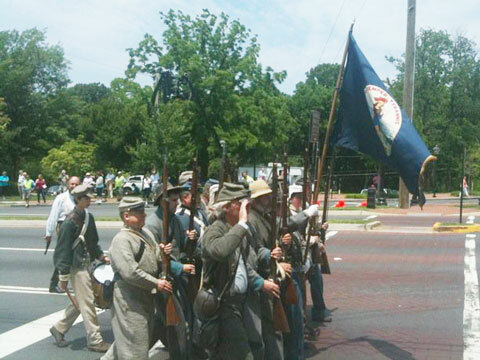 Here, the hometown Fairfax Rifles portray the Warrenton Rifles. Photo by Holly Nunn. Former (and future) Governor "Extra Billy" Smith (Dave Meisky, left) took over for the wounded Ewell as the Warrenton Rifles engaged the U.S. Cavalry. 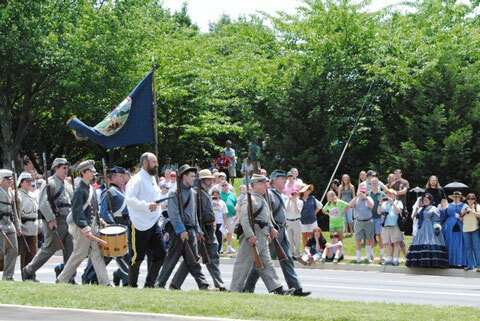 In 1861, both the Fairfax and Warrenton militias were mustered into the 17th Virginia Infantry Regiment, CSA. Photo by Holly Nunn. The Fairfax Rifles pass in revue after the skirmish and "Present Arms." (Left to right) Misses Ashley Beavers, Laura Kambourian, and Mrs. Karen Lewis came out to support the southern forces who were protecting the town. 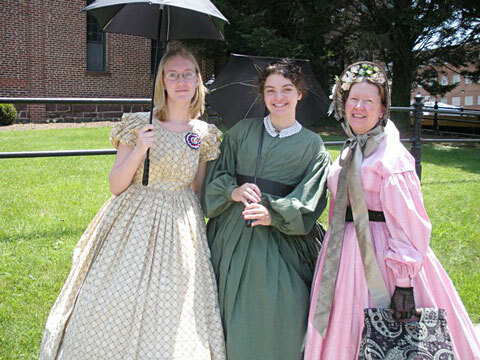 Ashley and Karen are members of the Fairfax Rifles reenacting group. Photo by The History Guy - William Connery. Click here for an article about the event with additional photos. Site Design by Stephen Wolfsberger Last updated June 16, 2011.